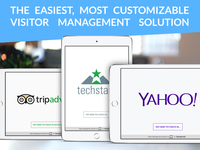 The most versatile, effective and easy-to-use Visitor Management system available! From offices with just a few employees to others over 50,000, the app is used by thousands of businesses around the globe. Whether you are looking for a simple visitor logging system to track your visitor traffic, or require a fully configurable, SMS and email based, two-way communication system with badge printing, The iPad Receptionist can solve your specific office needs. The Receptionist for iPad Reviews Recently Reviewed! An experience worth far more than the cost. Pros: There is not enough space to say all the Pros with the receptionist. The most astounding and remarkable feature of The Receptionist is the customer service and support. In the several months I've been using it, I've never had to wait more than 5 minutes for a problem solution. The problems are solved almost immediately, and if they can't be, we figure out an alternate solution to the problem at hand. Furthermore, this is a company that actually LISTENS and DEPLOYS suggestions. I've submitted several suggestions to them, and almost all of them have been implemented. If the suggestion benefits the overall experience of the customers, it gets added very quickly! In the years I've spent in IT and using dozens different applications and software, this is one that actually listens to it's customers and works very close with them to ensure everyone is happy. There's an abundance of different features you can customize to what you need your receptionist to do. We use 2 for lobby "visitor" check-in, and one for the shipping department for truck drivers to check in and clock their time. It's incredibly versatile! Cons: For an advanced user, some features feel a little bit limited, however they are quickly working on improving functionality of certain features to make it even more versatile! There aren't many cons I can come up with! 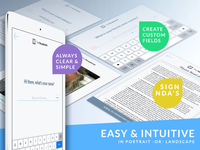 Overall: Automation, cost savings from using paper visitor logs, and ease of use! We are honored to have Autoneum as a member of The Receptionist Family. You obviously know where to reach us if you need anything and I am including my personal information so feel free to reach out anytime. Pros: The entire software really is superb, I cannot fault it. I have had many of our visitors remark on its simplicity. All in all, I have found my user and administrator experience excellent. That's from my first inquiry about the software, straight through to delivery, including iPad and printer! And the support, which for me is the strongest attribute, is absolutely outstanding. I have found the support to be responsive, professional, patient and polite. And with me being in the Republic of Ireland, that's all with a time difference. I have for the most part been dealing with the lovely customer service agent, who has been brilliant, but that said, any other operator I have been in touch with have equally been as helpful and obliging. On a few occasions, I have also used the extremely useful notes and guidelines and they are spot on, so accurately written and easy to follow. The value for money is amazing and with unlimited everything, you simply can't beat this product. So simple to use as a guest and so easy and straight forward to use as an operator. I highly recommend The Receptionist to any business looking to introduce a visitor management system. Cons: There is nothing I dislike about The Receptionist BUT if I had to choose one thing, the only con I can come up with (and it really is not a big deal) is that our logo doesn't print out in its full colour. Overall: Professionalism, Health & Safety compliance, value for money!! Wow! Thank you so much for your very nice compliments. I have shared your review with our entire team. Let us know if there is anything more we can do for you and your team. Pros: Customer support is fantastic! Can't stress that enough. The ease of use and keeping track of our visitors is very helpful and works great. A lot of our visitors are impressed with the use of technology to keep track of things. The use of printable badges helps everyone to know who is on campus and why, great product on that end. Cons: One of the main reasons we chose this product was for attendance tracking. There was very little follow up on whether this product was capable of handling this for us aside from the initial sales pitch where we were sold on the idea it could. After a few months there was no clear resolution made from The Receptionist side and it was determined from our side that it was not able to support this need. We were sold three accounts and only needed two, one for each of our locations. The transition to this product would have been better had these issues been addressed better to start. Overall: Security and peace of mind in knowing that we have a way to know who is on campus at all times. First off let me apologize. I am sorry that your pre-sales experience with our partner was not up to our standards. I am actively looking into this and I promise to get back in touch with you. Setting that aside I am so glad that the software is working well for you and Port View and that you have experienced our Radical Support. Thank you for being a member of The Receptionist Family! Pros: The portal interface can be mastered in a couple hours. There really isn't much investment needed to learn everything about the product and get your account up and running. Great customer service. Cons: The actual options of this application are minimal. I've found myself on more than one occasion "hacking" together a solution based on the options available. Overall: We wanted to do away with receptionists at our Corporate office, so we replaced that functionality with the iPad receptionist app. It's worked reliably for us, for the most part. The updates are highly manual, but that's usually not an issue. It took a few months for everyone in the office to get used to it, but here we are two years later still using it. Will probably replace this solution with a custom MS PowerApp at some point. Thanks for posting a review. I'm happy that it has been quick and easy to get up and running and that you've been able to experience our Radical Support. We really want to know more about your having to hack together some solutions. Our Dir of Engineering will be reaching out to you to learn more. Thanks for being a member of The Receptionist Family! Pros: The receptionist is slick ,intuitive and ensures fast sign-in for visitors visiting our office. We have been commended on a lot of occasions by partners and customers who pay us a visit at our office space. The receptionist makes it easy to search for the contact of any employee and even merge a photo to every employee contact. We recently integrated this tool with Badge-printer and this has made us to print badges for visitors to our office. The Receptionist ensures every visitor to our office environment is easily tracked ,allowing us know whom they are with. Cons: We have not encountered any issue of note since we started using this tool. It is an important part of ensuring security in our office. Wow! Thank you for sharing such a flattering review. I am so glad that The Receptionist for iPad is helping First City Monument Bank Limited managing its visitors. Please feel free to reach out to me personally if there is anything I can do for you. Thank you for being a member of The Receptionist Family! Pros: None of the other systems tested came close to being competitive in regard to cost and customer service. Another feature we like is the system is regularly being updated with improvements and more options. The people that we have spoken with and emailed at the company give us a real feeling that they care about your needs as a customer. Cons: The only issue we have had has been that our badge printer is networked and for some reason it occasionally goes to Wifi mode and badges will not print, but the system still notifies the host. 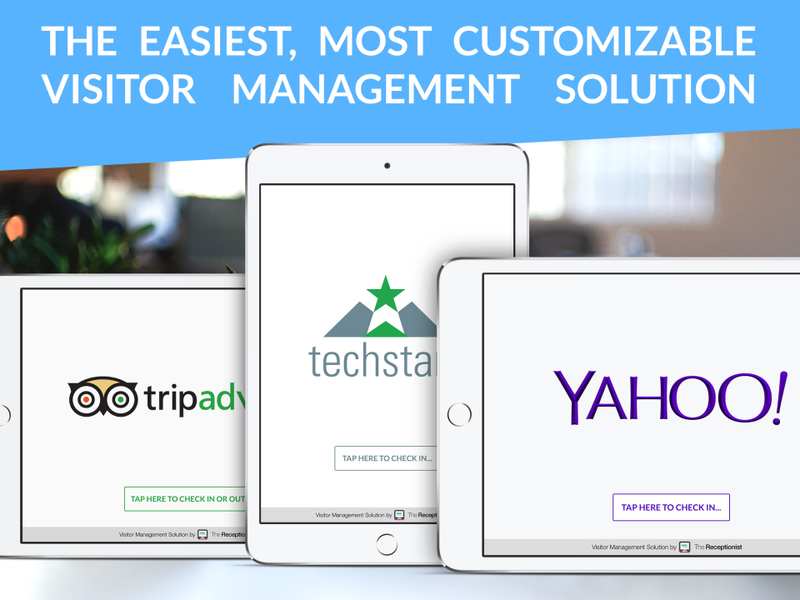 Overall: Before choosing iPad Receptionist we tried 3 other major Visitor Management software systems. We downloaded their free trials (typically 30 day) and purchased some equipment (ipad & badge printer) to have real world experience with all of them. Out of all of them, iPad Receptionist was by far the easiest to set up for the administrator of the system. The visitor sign in/sign out and host notification processes are both intuitive and reliable. Recommendations to other buyers: Sign up and try it, you wont be disappointed. Thank you so much for your very nice review! It was a pleasure meeting you last week at the TDK-Lambda facility. It's super impressive what you are doing and great to see so many high-end manufacturing jobs in the US! Let us know if there is anything we can do for you. Less issues compared to other vendors! Support is Grade A. Others have been closer to F.
Pros: Simple setup and configuration compared to other vendors in the similar industry. The web interface is simple enough to get use to. Cons: Lacking features to compete with higher tier apps in the industry even though they don't execute them that well. Features such as a like an emergency list if a fire occurs with all the people in the building and maybe even procedures/ contact list. The api needs to be able to push data out to other SaaS systems/databases. I am glad that you have experienced our Radical Support and that we are stacking up well against the competition. Could you please send me your full list of feature requests? As part of our Radical Support we listen very closely to our customers regarding the improvements they think we could make to the software. Thanks to you and the Dannon Project team for being a member of The Receptionist Family. Cons: The pictures taken of the guests are always dark. Overall: We've been using iPad Receptionist in multiple locations for a couple of years now. The ease of use is amazing. They have made some modifications over the years to allow for some personalization, which is good. We receive a lot of comments about how "cool it is" when our guests arrive. Thanks so much for posting a review of The Receptionist for iPad! I have asked Jessica from our support team to followup with you to help with setting the timeout on the chat screen. Pros: For the free version I've explored so far, it is a great tool!! I am in the process of checking out brick and mortar locations to open my own secondhand store. This software allows for people to check in via their cell phones with Receptionist for iPad and this software can be programmed to notify each person who would be expecting customers and or visitors. No more waiting at an empty desk while someone has to run to the back for a moment. Also a great perk is that this software is multi lingual !! Cons: I have not yet paid for the "Official" software but from what I have seen from the free offering, this is a marvelous tool for anyone who has an office, and even for people who have a lot of people to be expected at family events!! Overall: Love it so far. When and if I open my store I will be buying this software and using it. Knowing who is coming, when they are coming, all of these factors need to be considered in the business person's schedule. I think this is a wonderful new software and very user friendly. I am glad that your free trial has gone so well. I hope that you will open your store and implement our software to make things more efficient. Thank you for being a member of The Receptionist Family. Cons: Sometimes it doesn't want to stay connected to wifi. Overall: I have used the Receptionist for iPad for a year now. I very rarely run into any tech issues.. and when I do, they are usually very quick to reply and help me get back up and running. Everyone who checks in at our office thinks it's a really cool and "high tech" feature. We will continue to use the Receptionist for iPad for 2017! Recommendations to other buyers: Badge print out can be a bit difficult to deal with sometimes. Thanks very much for posting a review of The Receptioinst for iPad. Have you checked with our support team about the intermittent wifi issue? We find that installing a new wifi access point or placing one closer to the iPad solves the problem. Also, be sure to check with our team if you ever having printer issues. Sadly, the Brother printers require a lot of support but I have heard that a new model is coming out soon that will hopefully be less maintenance intensive. Thank you for being a year-long member of The Receptionist Family! Overall positive, it fits a need. Pros: Easy to use. Fits the simple need. User friendly. Looks good in the lobby. Keeps everyone from calling me or my assistant. Cons: The versatility is limited. I'd like to set refresh dates on videos and agreements, can't do that unless I remove and start everyone over. Would like to be a check out for lunch button, so we're not having to waist a second badge for guest/visitors. Be nice to get a text once a contractor leaves, just as a way to know for sure. Again just a few things that could be added to help the end user. Overall: cost saving of a headcount, and easy to use to assure the right contact is reached for guest. Thanks so much for taking the time to write a review about The Receptionist for iPad. I am glad the software is mostly satisfying your needs. I really appreciate your taking the time to let me know about the enhancements you'd like to see us make to the software. We take feature requests very seriously. I have entered a feature request for things you've noted. Look out for upcoming feature releases! Pros: This software has been wonderful for our college visits. It is very self explanatory with a lot of helpful features. Cons: I only have one complaint with this software. I wish I had the ability to have the notification sent to the counselor the minute the student clicks on their button and not have to wait until they finish the whole check in process. Overall: The Receptionist for iPad has been immensely helpful. I have personalized it to maximize the use in my department. Students have no problem using it and our counselors appreciate being notified the minute the student checks in. 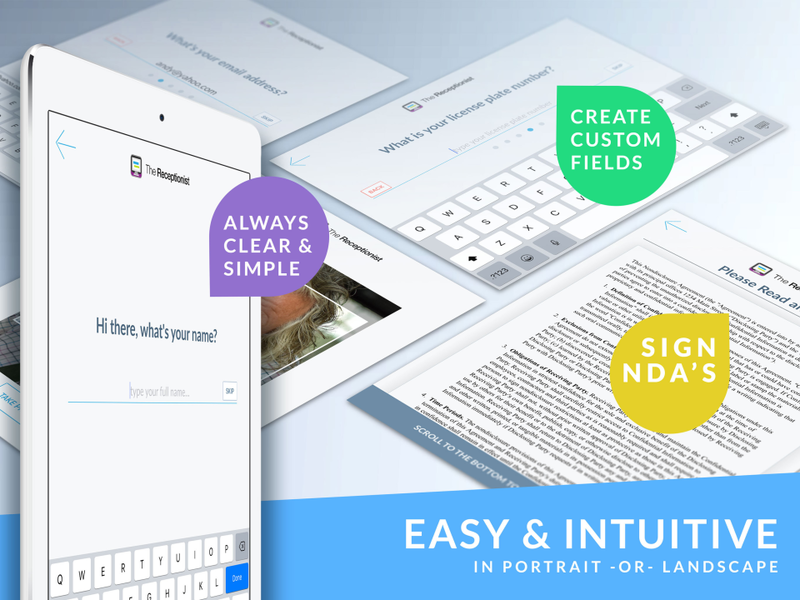 Thanks so much for posting a review about your experience with The Receptionist for iPad! I am so glad that you are enjoying the software. I am including my personal email address. Would you mind sending me an email so that I can understand what problem you are trying to solve by sending the notification immediately? We wait for the visitor to complete filling out the info so that the recipient or company contact has all of the info the visitor completed. It has been a welcomed change to our office. Both guests and employees alike find it very helpful. Pros: What we like most about the software is the ability to customize every option. We have been able to make adjustments with ease and instantly. Cons: The admin site does not automatically upload the visitor log when someone checks in or if there is activity with pick-ups and deliveries. The admin will have to remember to refresh the page to see an update. Also, we also have several visitors and customers we try to accommodate with the "delivery" option but are limited with selections so not everyone has their own button. It can cause some confusion. I really appreciate your posting a review about The Receptionist! I am so glad you are finding the software configurable to your needs. Also, I can't thank you enough for submitting your feature requests. We take these requests very seriously. I have submitted posted them to our feature request system and attached your email address so that you will be notified when they are released. Pros: Easy steps for setup of visitor checkin/checkout process, convenient retrieval and export of visitor logs. Also like that multiple locations can easily be setup by cloning an existing setup. Excellent customer service which always provides us with fast responses to questions. Cons: Would like to see the software available for an android tablet as well. Would also like ability for more customizing of visitor buttons using some logic options. Since there is only room for 6 buttons maximum, would be nice if check-in process could be controlled by answers to question(s) that are presented to visitors, which in turn could follow a "what happens next" for that customer type. Overall: Since we no longer have a Receptionist at our Front Desk, we urgently needed something to direct visitors as well as log their visit. The Receptionist for iPad looked like a "User" Friendly option and it has turned out to be a simple way to resolve our issue, without making it too complicated for the visitor. Comments: For the last 8 months I have been testing out 10 different receptionist applications to find the best one that suited our companies needs. The iPad Receptionist was the clear winner due to its ease of use, customization, and amazing customer support. We were looking for a notification system that allowed our employees to receive text messages when their guests were in our lobby. We also wanted our admins to be notified as well incase someone was away from their phone. The relay system with The iPad Receptionist is fantastic and allows our admins to be notified if the original employee does not respond within a minute. USPS and Fedex complained about our last application that we put in the field because they didn't want to type anything in and it was too confusing. With our current system, it could not be easier as they no longer need to type anything in and can choose preset options. We have gotten a lot of positive feedback since the change. From an admin standpoint, the backend is very easy to use/update. We were able to upload a CSV file with all the information, and set the relay contacts for each contact very easily. The price is also very reasonable. It fell within the middle, price wise, out of the 10 applications I tested. The customer service has been phenomenal! Their response time is great, and they are always very nice. Even more important though, I have submitted 2 bug reports that were taken care of within days, and have submitted feature requests that came out in later versions. It has been great working with The iPad Receptionist as they have made my job a lot easier. Thank you so much for the detailed and kind review of The iPad Receptionist! I know this takes time out of your day and I just want you to know it is much appreciated. Let myself or anyone on our team know if you need anything. Good product and great customer service! Cons: Would like language options. Language translation is something we look forward to in the future! 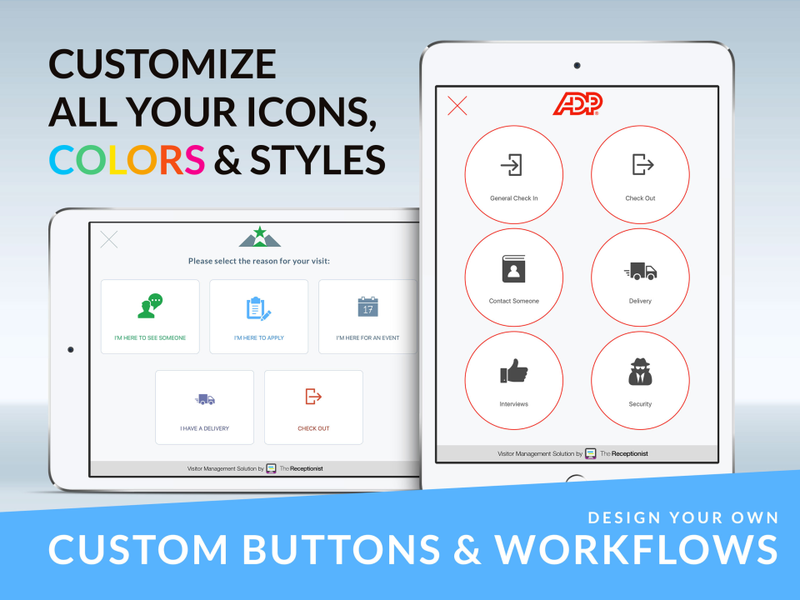 IT Department found limited/missing customization abilities for: button size, fonts, background/page image, clock header, layout/location, padding/margins. Overall: Gave our receptionist the freedom of not having to hand-write visitor badges. Overall, it looks better when entering our office, visitors are excited to use it. I am so glad you have experienced our Radical Support! Making sure our customers are happy with their experience is a top priority for The Receptionist. I am also happy that you have been able to take advantage of our drag-and-drop badge customization feature. This has proven to be very popular with our customers. I have added your two feature requests to our feature request tracking system. You'll be happy to know that both are high priorities for us. We will update you as we make progress on language localization and additional customization options. Incredibly efficient and easy to use! Pros: Fast, simple, easy to check in, check out, and log visitors. It's a great system for our business and we get a TON of compliments on it! Repeat visitors aren't frustrated anymore! I appreciate your taking the time to post a review about The Receptionist for iPad! I am glad that the system is working out well and that it puts Endeavor Robotics in a good light with your visitors. We do have a way to integrate with your AD. I will email you separately to be sure you have received this info in the past. Very simple and easy to use! It's simplicity results in some limitations, but overall great. Pros: Setup and configuration is easy. The interface is professional and polished. Also, it is entirely cloud based! Overall: It's great at replacing a paper sign-in sheet allowing us to keep track of who is in the building and maintaining a history. Thanks so much for taking the time to post a review about The Receptionist for iPad! I really appreciate your compliments and candid feedback about the customization options you are interested in. Would you be able to send me an email with details around what customization options you'd like us to implement including how we can improve our multi-lingual feature? I will personally enter your feedback into our feature request system and it will have an impact on the future of our software. Pros: The ease of use. We have used it for the past 2 years, and we basically set it up and haven't modified anything in two year and it has worked fine. We have had a few instances of the iPads crashing because of a receptionist or iOS update, but that's it. Cons: How long it took the features I originally requested to actually come out. I'm glad they finally did and that my request where heard. Overall: My best experience always comes from support, generally support team. The customer service she provides is ALWAYS excellent!!! My experience with support always spills over to my overall liking of the software itself. Thank you so much for posting a review about The Receptionist for iPad and also calling out our Radical Support! It has been wonderful working with you and your team at Vernay. Can you let me know which features were implemented and which are still outstanding? I'd like to check on their status and get back to you. Very easy to use and navigate, excellent price, superb customer service! Pros: I searched for a long time to find a check in system that would work for my office. I tried many systems and ultimately chose the receptionist because it is very easy to set up, allows for multiple offices on the same subscription, was affordable, and allowed for a customized and simple check in process. I also love that we can integrate it with Slack which we use. Cons: I wish it worked on android devices because those are far less expensive than iPads. I also would like for the company to be willing to sign a BAA for HIPPA compliance. However, we were able to find a workaround to avoid asking for PHI from clients checking in. Overall: Our staff is now immediately notified with a delivery is made or a client presents for a session. No more checking the lobby a dozen times! Our clients also like that the know the therapist has been notified since we do not have a traditional front desk staff. The solution to our problem...! Pros: It's so user friendly and easy to set up. Visitors think it's so modern and clever ... they love it! Overall: We love our iPad Receptionist. Although it may have some issues here and there (like all software does) the support provided to solving these issues is definitely 5 star...! Recommendations to other buyers: The iPad Receptionist definitely solved our reception problem. The support team was so great to deal with in setting it up and quick to respond with all our issues. For those business who do not have a receptionist as such, the iPad Receptionist needs to be your next purchase. Thank you for posting such a nice review! I am happy that our customers all around the world (including Australia) are happy with our software and service. As I am sure you know, reach out at any time and we're here to help. One of the best iPad Receptionist Programs out there! Overall: Our company was looking for an iPad program that could check in and check out visitors, take their photo, notify the person they were visiting of their arrival, have the capability to configure with a badge printer, and be able to export the list of visitors monthly. After much research, we did a free trial of The Receptionist and loved it! The customer support was great during set-up, as configuring the program with the Brother Badge Printer can be difficult. However, support made it simple! This program is easy to use and set up and makes our check-in program look very official. We are very happy with the personalization that this program offers. The only downside is that the program is not yet configurable with HipChat, our messaging system we use (Similar to Slack). Once they implement that, this program will be a 10/10! I really appreciate you taking the time to post such a thorough review and I am so happy that everything is working well for you and DATIS. I have to keep this hush, hush but we are actively working on the HipChat integration. I will be sure to enter your request into our feature request log. You will be notified once it is ready to go. Thank you for being a member of The Receptionist family since January 1st of this year! Please don't hesitate to let any of us know if we can help in any way. Great new tool - Badge Editor! Pros: The new badge editor tool is easy to change and update. It easy to customize and works well with the brother printers! Cons: I had a hard time finding the new badge tool. Wasn't sure if it was on the iPad itself or on the website. It makes sense where it is though (under the buttons on the site), since you may not want all the buttons to print a badge. Thank you for taking the time to post a review about The Receptionist for iPad. 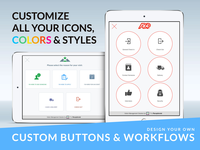 I am so pleased that you are enjoying our new drag and drop badge editor. It is truly unique to our application. It is an honor to have Texas NIC as a member of The Receptionist family! Pros: Simple and easy for our customers to use. Love the customizations and the service I am provided when I do need to contact someone. They are always friendly and issues are fixed usually within less than a five minute time frame. Cons: Wish it could do multiple sights on one machine (meaning we would have a device at each check in location but it would show me on my one admin login all 4 facilities in one). Thank you for posting a review about The Receptionist for iPad! I am so glad that you are enjoying our Radical Support. Thank you also for pointing out the feature request for central location management. We take feature requests very seriously. I have logged the request in our feature tracking system and attached your contact info so you will be notified when that feature has been developed. You will be happy to know that this feature is actively being worked on. I don't have a timeframe for you when it will be released but by being on the feature request you will learn about it before the rest of our customers. Please let me know if I or anyone else on my team can be of assistance. We are so happy that Re-Teck is a member of The Receptionist Family! You'll love it and so will your visitors! Overall: Overall its been a very positive and beneficial experience. Right form my initial enquiries through to testing , customer support and the final implementation it's all been a seamless process. It has increased administration productivity and decreased costs. Recommendations to other buyers: Try it! You'll love it and so will your visitors! Thank you for posting your review! Hearing that you have had a great experience with our product and our company is exactly what I hope to hear from our customers. If there is anything we can do for you please don't hesitate to reach out. Thanks so much for posting a review about The Receptionist for iPad! I am so happy to hear that the application is working for you and Chegg Inc! Please don't hesitate to reach out to me personally if there is anything I can do for you. Amazing service -- very responsive and helpful! Pros: The software is easy to use and work with. Having the iPad receptionist is also an added security feature for the office. Thanks so much for posting such a nice review. It is great to have one10 and Aimia as longtime members of The Receptionist Family! Let us know if there is anything we can do for you and your team. Pros: i like the ease of use and the ease of setup the most. It has most of what we needed right out of the box. Cons: it only supports 2 types of badge printers an with the system relying on wifi you need a strong connection. I'm so glad The Receptionist for iPad is working out for you and Umbra Cuscinetti Inc.
We have alternate configurations for the printer so that it can connect via Ehternet that would improve the performance if you're wifi isn't strong enough. Fire me an email and I would happy to help! Great Visitor Management System for the Money! Pros: This is the most simple easy to use product for not only our staff, but also our visitors. This takes very little staff assistance to support and get people logged in. Return visits are quick and easy and the time savings for staff and visitors has been significant. Cons: We wish you could customize the interface and database such as adding attachments, but currently this isn't an option. We also would like to be able to scan in using a scan of our exiting badges which we currently use, but this also isn't currently an option. These aren't show stoppers by any means and are very specific to our environment. They allow for feature requests which we had submitted for these needs. Thanks so much for your review. I am really glad the software is working for you and Dakota Creek! I was going to offer to enter your feature requests but it looks like our team has already worked with you to file them. If there is anything I can do for you and your team please feel free to reach out to me. Pros: The receptionist keeps our client information in one place and allows for check in and check out to be seamless and intuitive. Cons: I wish there were more options when it came to the buttons, such as removing a required input field from some buttons. I also wish there were just more customization options. Thanks for posting a review about The Receptionist for iPad! I am glad that Workability is enjoying the software. I have entered a feature request regarding more customizations and attached your email address in our feature tracking system. Should we release these features we will notify you directly. This has been an upgrade to my facility! Pros: The ease of use for my clients and functionality the software provides. Clients can navigate the software without confusion. Cons: The adjustment to buttons from an esthetic perspective can sometimes be slightly difficult or limited but it's still sufficient. I appreciate your posting a review about The Receptionist for iPad. I am glad that the software is helping out Limitless Performance Training. Thanks for being a member of the The Receptionist Family for over a year! Pros: Ease of use, low maintenance, it uses Apple. Cons: The printed badges, they need some help with design. They are very basic right now. 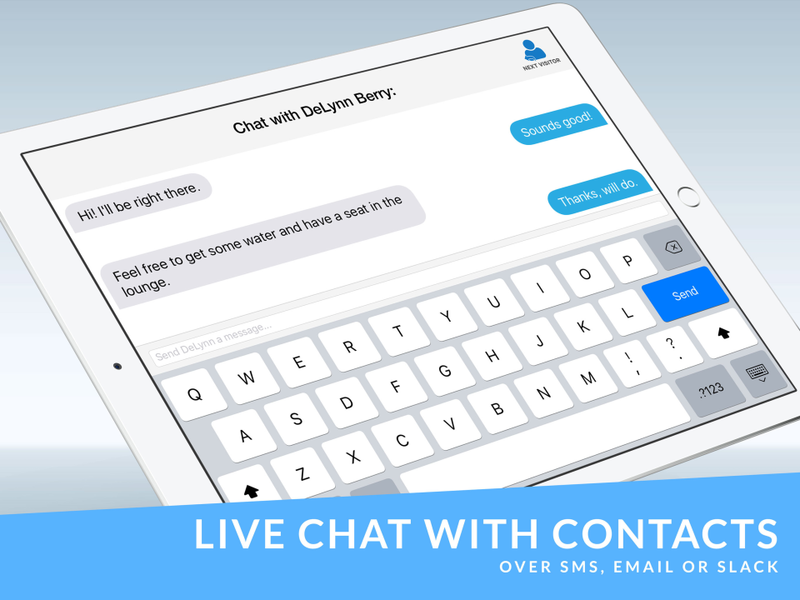 Overall: We have been using iPad Receptionist for several months now and would highly recommend it to our business partners for use in their facilities. Jessica is always a pleasure to work with and is very knowledgeable about the product and new features we need assistance with! We have audit requirements for the services we provide to our customers so typically we have always used a check in sheet. This product/software has been more efficient, professional, and organized for our processes and procedures. Recommendations to other buyers: When a software update is out and we update, the software moves around our buttons and settings. Not sure why but this seems to happen every time. Thank you for taking the time to post such a thorough review! Updating the badge printing is on our development roadmap. We will let you know when we release more controls over badge printing. We are also checking into the issue you are reporting about the buttons moving around. Thank you for being a member of The Receptionist family and don't hesitate to reach out to us at any time! I couldn't be happier with both the product and the service. Pros: it is easy to use and makes for a more efficient sign in process. if there is a problem the support staff is quick to respond and help find an solution to whatever your issue is. Cons: I have no serious cons to list. the only slight complaint I would have would be the limited ability to design and customize fonts for the home page. Thank you for posting a review about The Receptionist for iPad! I am so glad you are enjoying our Radical Support. I am going to add your request for additional design and customization for the Home Screen to our feature request log. Pros: Simplicity to setup and use. Overall: We came across this solution about a year ago. Back then it offered all we could possibly want but these folks keep adding new features and it just gets better and better! Recommendations to other buyers: I don't know why would any business be without one of these! Thank you so much for your kind review. I am really happy that the system is working for you and your company! Let us know if there is anything else we can do for you and Bossard. Thank you for being a member of The Receptionist family! Cons: A que status would be great or an interaction with the user to there personal device. I appreciate your posting a review of The Receptionist for iPad. We are so proud to be working with DPS and glad that you like the software! Thank you for being an esteemed member of The Receptionist for iPad family and let me know if there is anything I can do for you or your team. Support got back to me in less than 1 minute and we were able to "trial" badge printing with ease. Pros: The fact that you can tailor it to our business is awesome. The customer service is AWESOME! They respond almost immediately and then provide you with step by step instructions to perform the task. Cons: There aren't enough spaces for names. We have to generalize departments and then when a visit sends a message it is up to the department to find out who has an appointment with that guest. Options for responses are also limited. Overall: I am comfortable with the fact that I can walk away from my desk to do various tasks without leaving someone standing in the lobby. Thank you for your review! I am so happy that The Receptionist for iPad is working for you and your team at Gordon Foods. I'm going to work with our sales and customer experience teams regarding your notes in the Cons section. If there is anything I can do for you please don't hesitate to reach out to me directly! Thanks for being a member of The Receptionist Family! Comments: The software and the iPad itself were very easy to set up and configure. The instructions are very light, mostly because the set up process is very simple and mostly automated. In functionality, it works nearly flawlessly. When a contact is reached by a guest, the contact can be set up to receive an SMS text message which can actually be replied to - very useful when the contact needs to let them know they'll be a moment or if they're out of the office and the guest will need to contact someone else. The only con is that the recommended wireless printer is only compatible with wireless security up to WPA2 which required me to create an additional wireless network specifically for this printer. Any time we have encountered an issue with the software or its management console the support has been available, responsive, and knowledgeable. Everything from label formatting, to images not appearing were all resolved in less than 30 minutes with support. Thanks so much for your kind review! That's good information to know about the wireless printer and the wifi security it uses. Brother makes another printer which is compatible with The iPad Receptionist, the QL-720NW which can be connected via ethernet. This might be a solution so that you don't have to create a second network. Let us know if there anything else we can do for you! 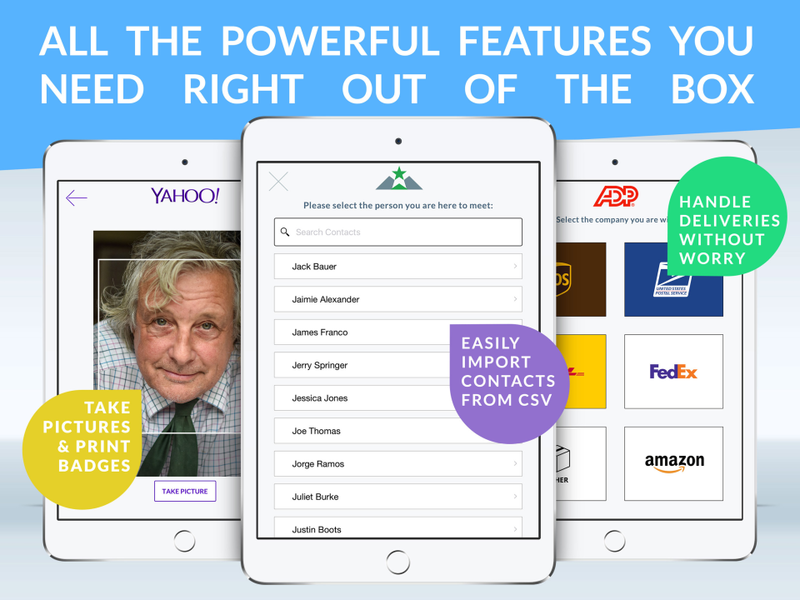 Pros: Sign-in is fast and easy, and it even remembers people who have signed in before. Buttons are customizable with cute little icons. The design is sleek and it's overall very easy to use. Cons: I have yet to find a "back" button that allows the visitor to return to the previous screen if they've accidentally entered something incorrectly. I appreciate your taking the time to post a review about The Receptionist for iPad! I am so glad you like the experience the software provides. We're always making improvements so let us know what changes you would like to see us make. When checking in and someone enters information and clicks the check mark to get the next question, on the left side underneath the entry box there is a left arrow. That is where the person can go back to re-enter info. Please let me know if that answers your question about the back button. Thank you for being a member of The Receptionist family since September of 2017! The Receptionist creates a quick, streamline manner in which to greet our guests. Pros: The text alert system is very beneficial for our office space, as we are all changing offices and aren't always near the front. With so many offices under one building, it's easy to identify who the guest is here for. Cons: The stand for the iPad isn't eye catching and sometimes gets lost on our front desk. It would be great to have a larger stand that would clearly greet others. I appreciate your taking time to post a review about The Receptionist for iPad! I am glad that it is working well for Be Music. Would that be more appropriate for your reception area? Send me an email if you'd like to learn more about our floor stands. Also, placement of the iPad in it's stand is key. You want to try to place it in the path of the visitor so they can't miss it. Simple, effective solution for patient check-in system. Pros: I like that it is simple to set up and use and works consistently. We use this in a medical suites environment with multiple independent doctors who have their own patients. Cons: Has frozen up once or twice in about 4-5 months of use. I think usually associated with automatic OS updates. Because I'm using this for different independent doctors, it would be nice if I could have each doctor have their own patient forms that could be signed on the screen, but that isn't possible now. I currently have 15 and more will be added. Thanks so much for posting a review about The Receptionist for iPad. It sounds like the system is working well for you. I will submit your feature request and I will tag you so that as something similar becomes a reality we will be in contact. We are happy to have Viva MedSuites as a member of The Receptionist Family! Love this product it works amazing for our office. Pros: Very simple to use even the most novice users can navigate. Customer support is above amazing, they are very responsive to messages and truly want you to take advantage of everything the product can offer, they go above and beyond to help you. This product makes checking in visitors to our location easier then ever before. Cons: Can be a little challenging to set up to begin with - However if you take the time to read the very helpful guides that have been set up you won't regret it. I really appreciate your taking the time to post a review about The Receptionist for iPad! I am so glad that you have enjoyed both the software and our Radical Support. We try very hard to exceed your expectations with each interaction. If there is anything else we can for you, don't hesitate to reach out and thank you for being a member of The Receptionist Family! Printer setup was easier with tech support. Pros: It's user intuitive and well thought out. Support is really great. The program is constantly evolving. Cons: Any issues I have seem to get resolved quickly, with the updates and changes. I have rarely had issues. I am so glad you have been happy with our Radical Support! We work very hard to provide our customers with a delightful experience. Let us know if there is anything else we can do for you and the team at Nut Butter Concepts and thanks for being a member of The Receptionist Family! We have been very happy with the service, it has allowed our receptionist to step away when needed. Pros: We are extremely happy with the amount of customizeable options. We have many large meetings and training conferences and this allows us to set up specific sign in buttons that keep track of who came, what time the arrived and how long they were in the facility. The report option has been incredibly helpful to keep paper trail down and able to keep things electronically. Cons: I wish the home screen had more customizing options. Like the logo area and adding more typed text without having to change logo. I am thrilled that you are happy with The Receptionist for iPad! We take feature requests very seriously. I have logged the request for more home screen customization in our feature tracking system and attached your contact info so you will be notified when that feature has been developed. Welcome to The Receptionist Family! We have been testing and using the iPad Receptionist App for about a year. Comments: The few negatives is the iPad receptionist is missing a key function we need, however it is being developed. We need the ability to identify the locations of where a visitor is checking in at. We use the same enterprise ID, but have two locations that check-ins occur. Also we use badge printers and there is little to no self customization to manage the complete badge layout. The Positives: Our visitors love the iPad Receptionist experience as it enhances our existing reception area. Companies that use paper sign in sheets cannot duplicate the accuracy the ipad Receptionist provides for visitor log management. There are few bugs with the app and above all the customer service is exceptional. The product is improving and is adapting well to our Visitor Management Process. I would recommend the iPad receptionist to any company. Thank you for your review. Last week we released the ability to identify the iPad location! Please download the latest version of The Receptionist app, go to The Receptionist settings on the iPad and you will now see two new fields - iPad Name and iPad Phone. The location is transmitted in the message to the contact or employee and it will also show up in the visitor log. Let us know what you think of this new feature! If there was a six star, I would be using it! Pros: Our clients resisted using the app at first, but now are so used to it! Our staff is so happy that we are no longer using paper and pencil because we are attempting to be a paperless office! Thank you The Receptionist for making our work easier. I am so very glad you are happy with The Receptionist for iPad! Please let us know if there is anything we can do for you and your team. The report function and e-mail notifications to our employees is a time saver for Admin. staff. Pros: Enjoy the customization functions and the reporting feature. We use to manually calculate visitors from sign-in sheets on a monthly basis, which was very time consuming. Before the iPad Receptionist, the Front Desk staff would have to call employees when they had a visitor, which took time from other needed functions. We enjoy the e-mail notifications which alleviates that for Front Desk staff. Cons: Sometimes it freezes, but that's just related to internal network connection. We don't have any other issues with the product. Overall: Customization and automation. A time saver in calculating visitors and reasons for visits each month. Thanks so much for being a long-term member of The Receptionist Family. You've been with us since before we changed our name from The iPad Receptionist! I appreciate your taking the time to post such a nice review! Cons: Would like to have a feature that can give users read/write access to visitors that they are affiliated with instead of the entire visitor log. Thank you also for pointing out the feature request for employee access to the visitor log. We take feature requests very seriously. I have logged the request in our feature tracking system and attached your contact info so you will be notified when that feature has been developed. I do have an idea for you that could be a good short-term solution. Can you email me? Please let me know if I or anyone else on my team can be of assistance. We are so happy that Cheniere is a recent addition to The Receptionist Family! Good and bad. Lacking features in specific areas. Pros: Ease of use and implementation. Very intuitive, best by far of the competition. Great at making the sign in process smooth for guests. Cons: Feature Set and Customization. Other solutions have better ability to tweak features and modify from a plain vanilla solution. Every aspect could do with a few additional features to make the solution the ultimate virtual receptionist. Ability to backdate checkout of guests in portal. Ability to receive notification if guest does not checkout by end of day or preset time. Ability to delete guests that are registered in device. Ability to block guests that have pre-registered and flag if guest attempts to re-register. Ability to send notifications on check out of guest. Ability to customize e-mail notification form and change sender address. Better layout for customizing visitor interface, what you see in portal is not always what you get. I really appreciate you taking the time to send us your thoughts and feedback. Apologies for the delay in responding. I just wanted you to know that I have logged your feature requests in our feature tracking system. Our product and engineering team takes feedback very seriously! Pros: I love the Slack integration and the sleek design. Everything is very user friendly and the support team are always available at a moments notice via the very accessible live chat button on the web interface. I especially love the visitor response canned comments for the two-way chat. This makes it very easy for our employees to communicate effectively with our visitors. I really appreciate your taking the time to post a review about The Receptionist for iPad. It is so awesome to get feedback from one startup to another and particularly that you are satisfied. :-) Adding more integrations to The Receptionist platform is definitely on the Roadmap though I don't have a timeframe I can give you. Thank you for being a member of The Receptionist Family! Let us know if there is anything we can do for you and your team. Pros: Customizable and we were able to request if the visitor is a US citizen for trade compliance purposes. Cons: Working on enlarging the photo and name on the badge is there are options for this. If not, it should be added. Thank you for taking the time to post a review about The Receptionist for iPad! I am glad that our ITAR Citizenship feature is working for Xylem!